After posting about some local events that I attended in the NY area (Delta’s T4X and The Great GoogaMooga), it’s time to get back to posting about our visit to New Orleans. 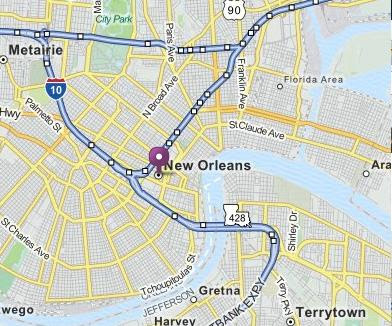 Check out my post about Day 1 in N.O. here. Day 2 was another busy and fun filled day. We started off early by going on a swamp tour. We also sampled some great local eats, explored the Warehouse District and spent some more time on Bourbon Street. I also enjoyed learning more about World War II at a very impressive museum. After corresponding with Cajun Encounters for a couple of weeks, they were kind enough to invite Kim, Lucas and I to take their Honey Island Swamp Tour. The tour was definitely one of the highlights of our visit. We were picked up at our hotel and then (after making a few more stops) drove about a half hour to the swamp. It was a beautiful day for the tour. Our guide was very friendly and knowledgeable about the swamp. He talked about the fisherman that used it as their livelihood and told us about the homes along the river. The best part of the tour was seeing all of the wildlife in the area. We expected to see alligators but also got to see turtles, snakes, wild hogs and various birds. When I make it back to New Orleans in the future, I’ll most likely take this tour again! While reading about all of the great food options in New Orleans, I heard lots of great things about Cochon Butcher. I placed it at the top of my list and it did not disappoint. When we arrived, Butcher was busy. We luckily found a table and the line at the counter moved fast. I had read that the must try item was the Muffaletta made with house meats and olive salad. The sandwich was really fresh and amazingly tasty. I’d definitely recommend trying it if you stop by. We also had Duck Pastrami Sliders and Pancetta Mac N Cheese. These dishes were also incredible. Our meal at Cochon Butcher was probably the best one we had during the trip. Everything we had was great and I’d definitely like to visit again. Less than 5 minutes from Cochon is the National World War II Museum. The museum is expanding and takes up thee buildings, One was under construction and the other had a film playing in it. The museum building had lots of war artifacts including weapons and uniforms. There was loads of information regarding the United States’ role in WWII. As we walked around the display areas, there were areas to sit in that were playing short films, many showing WWII veterans talking about their experience during the war. If you’re interested in World War II history then this museum is a must visit. I really enjoyed, Kim didn’t mind it but wasn’t a huge fan. I couldn’t pass up the opportunity to visit the oldest family run restaurant in the U.S. so for dinner we headed over to Antoine’s. Antoine’s has been open since 1840 and is a huge restaurant made up of 14 rooms. There was lots of history inside- crowns from Mardis Gras to a huge collection of restaurant ash trays from around the world. Antoine’s is a bit on the pricey side so we decided to order a few appetizers during our visit. Although Kim and I are not really fans of oysters we had to try their Oysters Rockefeller, a dish Antoine’s invented in 1889. The dish consists of “oysters baked on the half shell with the original Rockefeller sauce.” Kim and I enjoyed the dish but it was hard to figure out what the sauce was made of. I think it was worth trying but not something I’d need to try again. We also enjoyed their gumbo, shrimp Remoulade and puffed potatoes with Bearnaise sauce. I remember trying a Hurricane during a visit to New Orleans years back but Kim had never tried one so a visit to Pat O’Briens was a must. The Hurricane was created at Pat O’s during the 1940’s when various liquors were hard to come by. To purchase one case of some of there liquors, salesman would force bar owners to buy huge quantities of rum. A cocktail was then created to use the rum. At first the Hurricane tasted a lot like cough syrup to me, but after drinking most of it tasted a bit better. It’s a pretty strong drink and I’m guessing that many would disagree with me and do like the flavor since it is so popular! Walking along Bourbon Street at night is an experience in itself. I love how the buildings look when lit up and seeing the wacky characters out in full force is also a lot of fun. Music is blasting from many of the bars which adds to the experience. I found the contrast of Bourbon Street during the day and at night to be pretty funny. Quiet with a European feel during the day, loud and crazy at night. That’s it for the recap of Day 2 in New Orleans. Keep checking back for more about our visit.